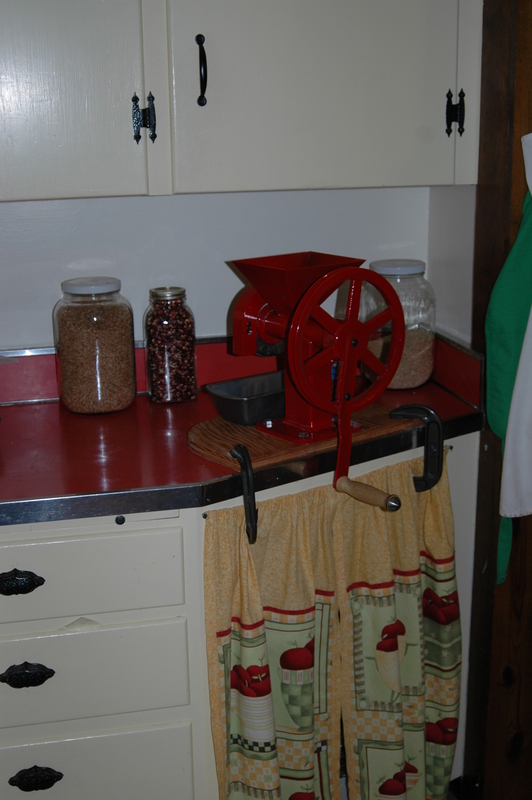 In April, 1999 I became the proud owner of a Country Living Grain Mill. It was a big purchase for our family, but I had been using a Corona mill occasionally for about ten years and had decided it was time to get serious about having fresh ground flour. The Corona was good for cornmeal, but not so good for whole wheat flour for bread. The effort it took was not something anyone in our family wanted to endure on a regular basis. I scoured the internet looking for information about all the choices out there. I wanted to save money, but I didn’t want to buy anything that would end up being too troublesome to use. I finally decided to go with the Country Living Mill and have never regretted that decision. It’s the white one in the picture. In September, 2010 I had an opportunity to try a GrainMaker mill when the folks who make it were at the Mother Earth News Fair in Somerset, PA. I really liked it and thought it seemed easier to use than the Country Living Mill. I was in a position to buy it and, since part of my mission is to help others along this path, I thought it would be great to compare the two and share my experiences. Long story short, the GrainMaker mill is now my favorite. The GrainMaker was ready to use out-of-the-box except for attaching the handle. It even came with five pounds of wheat berries! I was right, it was easier to turn than the Country Living Mill, but then I realized that I didn’t have the extension handle on the Country Living. Once I put that on, the handles were about the same length and the effort to use them was about the same. What really made the difference is the amount of flour generated with the same effort. The GrainMaker produced TWICE as much flour as the Country Living Mill with the same number of revolutions! In 300 revolutions I have gotten about 1 c.3T. flour with the Country Living Mill and 2c.6T. with the GrainMaker. The amount of flour in the jars is what I got from one 300 revolution trial for each mill. What is in the breadpans catching the flour is from another 300 revolutions. 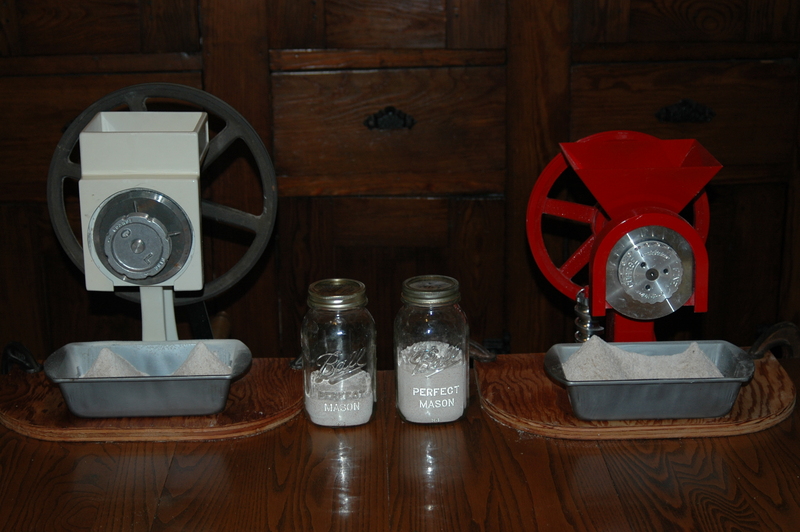 You can see from the pattern of the flour in the pans that the Country Living Mill drops flour mostly from the sides of the grinding plates, but the GrainMaker Mill also drops a significant amount in the middle. The pattern on the grinding plates of the GrainMaker is rather different, which might account for that. Another big plus with the GrainMaker is that the corn/bean auger sits on a spindle on the mill and is super easy to exchange with the grain auger. There is more involved with changing out the augers with the Country Living Mill and I have to remember where I put the extra auger and other small pieces needed. If I could change one thing about the GrainMaker, it would be to have a longer wooden handle, such as the one on the Country Living Mill. The GrainMaker is now attached to my kitchen counter and the Country Living Mill will eventually go to one of our grown children, when they are ready for it. For another testimonial from someone who has used both mills, check out Dan and Margo’s Circle of the Sun blog for January 27 and April 6. I have mounted each of my mills to a piece of 3/4 ” plywood with lag screws. I use C-clamps to hold the plywood to the counter. We removed the lower cabinet door and I made curtains for that opening with slits that allow the clamps to go under the counter. Knowing that many people might not have counter space for a mill, I wondered how it would do on a small cart. I have one in the kitchen that holds the many jars that seem to be always around. I attached the GrainMaker to it to see how it would work, anticipating I would need to move the jars and maybe add some weight, but it worked so smoothly, the jars stayed put, including all the ones in the bottom of that cart. Since it had wheels, it did move a bit when I was grinding, but once I rolled it over onto the rug, the problem was solved. If your kitchen currently has no space for a mill, you might want to consider buying or making a cart that can be pushed out of the way when not in use. You could store your grains, dehydrator, or whatever you want on the rest of the cart. Locking wheels would be good, or roll it to a rug to use. There has been a price increase and some design changes since I bought my GrainMaker, but knowing what I know about both mills, I would still choose the GrainMaker over the Country Living Mill. Twice the flour for the same work is a HUGE difference and I’m not getting any younger. Not everyone can buy the mill of their dreams right now. Remember, I started out with the Corona so many years ago and I still have use for it now and then. Start somewhere and work from there. If a mill doesn’t grind fine flour, it can surely make cornmeal or crack wheat berries and rice for hot cereal. In her book The Resilient Gardener, Carol Deppe prefers using her Corona mill to grind corn to make polenta. Do any of you have thoughts on grain mills that you would like to share? Thanks for doing this blog! I have a Country Living mill and an electric whispermill (doesn’t whisper AT ALL). To be honest, I use the electric one all the time. The Country living mill, while it most certainly produces a nicer flour, just takes way too long and the electric one is just too quick. I’d like to get my CL mill hooked up to a bike so I could pedal and grind. I think I could get my kids to do that. I also had a problem getting the CL mill anchored to something solid enought that it didn’t seem like half my energy was going into rocking the very substantial island is was bolted to. So, if I could mount it on the wall and hook it to a bike, it MIGHT get used before the whispermill. 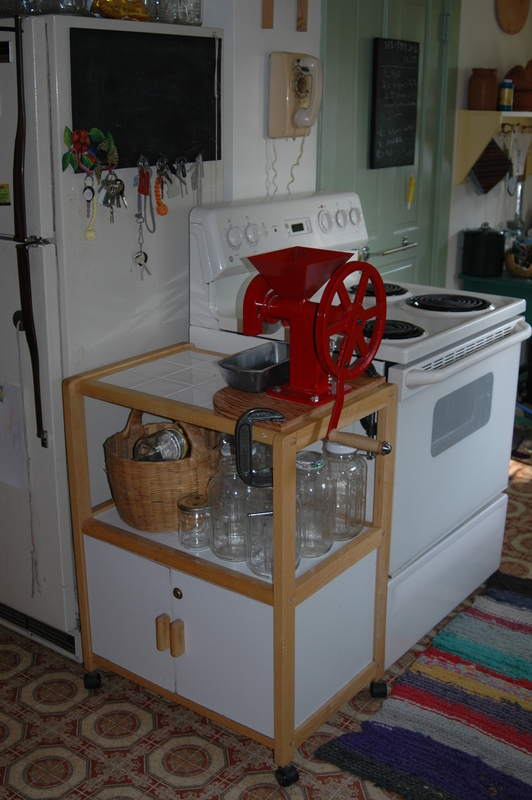 Vicky, after reading your comment I attached my Country Living Mill to the small cart you see in the photo with the GrainMaker. I had no trouble using the Country Living Mill on that wheeled cart once I moved it to the rug. I had it lag screwed to the 3/4″ plywood and the plywood was anchored to the cart with C-clamps. Someday I might explore pedal power for things, but then I’d have to put the pedal contraption somewhere. I’ve seen plans for a pedal powered blender. My friend with the Diamant is able to use it with pedal-power, but then she uses her arms all day playing the viola. I haven’t found the hand grinding to be bothersome. Great post and very informative. You have done a great job. Hello, just purchased a country living grain mill, and called the company to ask for mounting suggestions. They are supposedly coming out with a black powder coated clamp in 1-2 weeks. Somewhere around $39.00. Aside from that bit of news, it was mentioned the red paint on the GrainMaker mill was not FDA approved, and toxic. Heard anything on that? Congratulation on your new mill! I checked the Country Living mill website to catch some information about their clamp. I thought they would have a “coming soon” announcement, but I didn’t see anything. I had not heard of anything like you mentioned about GrainMaker so I checked with them myself. They don’t use paint at all. Here’s what they said— ” it is a powder coat finish that we apply. It is not paint, it is a powder that is baked on. We NEVER apply any type of finish to the inside of the feeding tube when we manufacture our mills. The feeding tube is where the grain feeds into the burrs. This is important because this is where all the heavy friction takes place and any type of product applied to this area would eventually wear off and the consumer would eat it. We NEVER apply any finish to this area whatsoever.”—-This is a safe mill and, as you might imagine, I’m pretty picky about these things. Both the Country Living Grain Mill and the GrainMaker are great products. I hope you have many happy years of grinding. Could you tell me which model of GrainMaker you have? I’m looking at their website and the different models vary greatly in price! Thanks so much for this review!! My GrainMaker is not on the website. When I bought it in September 2010 they only had one model. The hopper on mine holds 4 cups of grain. The new model holds 6 cups and the wheel is larger. I’m glad you found this post helpful. It’s just the kind of thing I would have been looking for when I bought my Coiuntry Living Mill so many years ago. Found your blog thru a Google search of Grain Mills….and really appreciate your comparison of these 2 mills. We are currently in the market for a mill and recently stumbled on the GrainMaker after years of dreaming of owning the Country Living mill. May I ask which model GrainMaker you are using? It ‘looks’ like the model #99 but kind of hard to tell in the photo. Thanks! Maureen, I’m glad you found my post helpful. When I bought my Grainmaker they only had one model, so there was no number associated with it. Mine is like #99 except it has a 4 cup hopper and a 10″ pulley. They don’t advertise that one anymore, but they were selling it until their supply ran out. Hi! Thank’s for all the great info! I was wondering if you had tested the Diamond and if so, what you would suggest between Diamond and Grainmaker, and for what reasons. Thank’s a lot! I assume you mean the Diamant. I haven’t compared it side by side with the Grainmaker, but I’ve used one that my friend owns. It’s nice, not doubt about that, but it is also pretty costly. The one my friend has was made in Denmark. I believe Diamants are now manufactored in Poland, so if I did a comparison, it might not reflect what you would be buying now. Thank you a lot for your reply Cindy. Yes, I meant the Diamant, sorry for the mistake. I do not mind about the beauty of the mill, but I was wondering if you could see a fair difference in effectivity, easier to turn ? The Diamant was easy to turn, but it’s been more than two years since I actually had my hand on it. I would have to have both mills together at the same time, such as I did with the Country Living Mill, to speak to the differences between the Diamant and the GrainMaker. Maybe one day this winter I’ll take my mills to Molly’s and we’ll do a trial. If that happens, I’ll surely write about it. Switching production of the Diamant from Denmark to Poland might have affected the quality of the materials used in the manufactor, which is something you could research, I suppose. They look identical, I believe. Thank you very much for your fast and clear answer. I think I will be purchasing the GrainMaker, and I’ll keep on reading your blog! Sarah, I am really surprised you found both mills on Craigslist. I have never seen either one for sale used. I’m glad you like your GrainMaker. Thanks for keeping this post up! I just LOVE my GrainMaker. It is built to last, offers an amazing heirloom guarantee, and is made in the USA!!! I even got a free bag of wheat with my order. 100% satisfied! We just put our new GrainMaker 116 through its paces and couldn’t be happier. Grinding wheat and corn was easy, even for me! (I don’t have much upper body strength, yet had no trouble at all). I suspect the larger burrs and handle of the 116 may give it a mechanical advantage over the 99 — wish I could compare the two side-by-side like you did with the Country Living mill. Thanks Valerie. You will have many years of happiness with your Grainmaker 116.